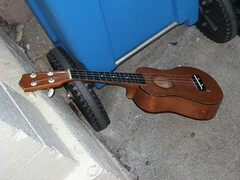 One thing that’s interesting about San Francisco is how you’re always finding crazy stuff in the street. On one of our pre-move trips here, we found a giant Indonesian walking stick (Euryncema species) mounted in a box, which, of course, we now have displayed proudly in our home. More recently, I’ve seen a denim-covered television set, a stack of bibles, and a 60s-era movie projector. In Austin you really had to wait for big-trash-pickup days to see the kind of weird stuff that gets left on the sidewalk every day here. I’ve decided to start documenting it. 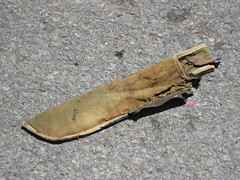 This scabbard is the first in what I predict will be a robust and ongoing series of photos of stuff in the street.